Secure Pro Jack Knife Lock Pick Set | BUDK.com - Knives & Swords At The Lowest Prices! 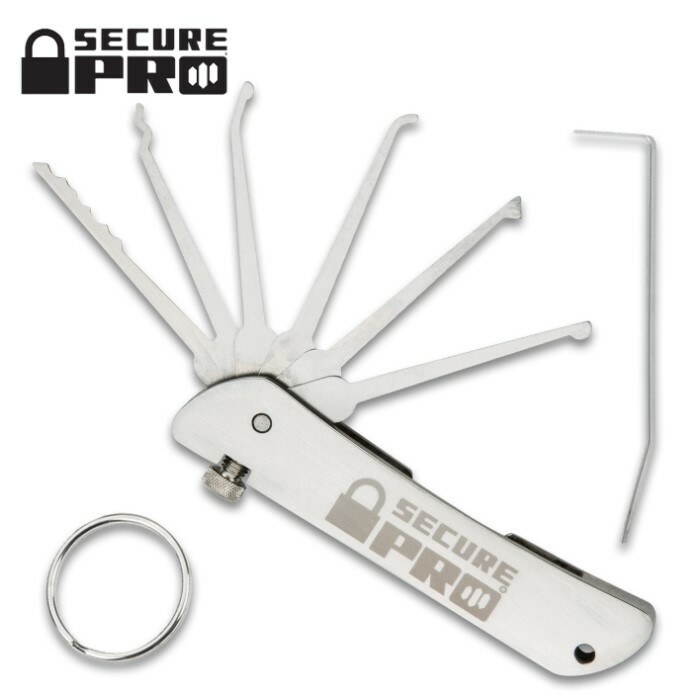 The Secure Pro Jackknife Lock Pick Set features tempered stainless steel picks, knurled stainless steel set screw for a positive lockup, and a hard alloy handle for increased durability. Bought the elite mystery box and it arrived today with this in it as well as a practice lock. I was stoked big time because while I knew the fundamentals of lock picking, I never had the picks to practice. When minutes of opening this and the lock I was owning it consistently with few hangups. My only qualms is that the screw doesn't positively lock the picks in place when picking, they become loose and wiggle in the handle. Aside from that, I have no issues and absolutely love it. BudK, you've done it again for me. 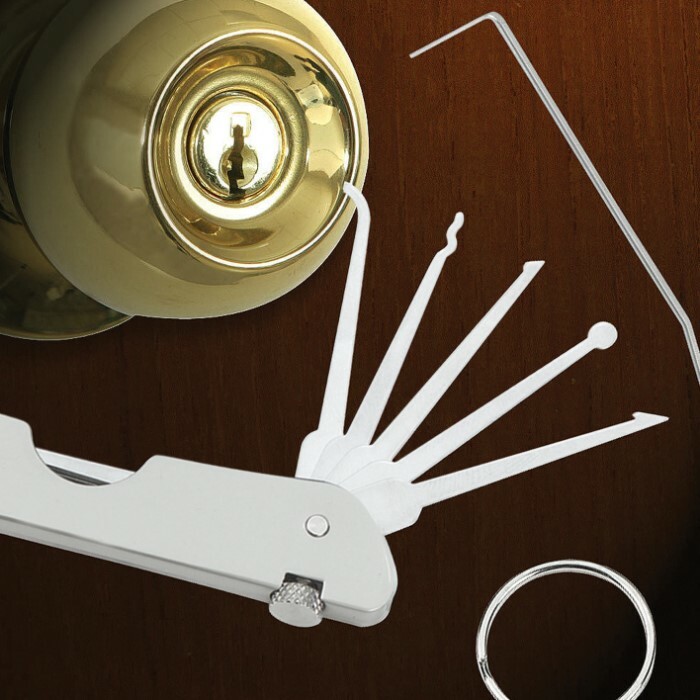 This lock pick set work amazing, its worth it, very useful in case of emergency. I got this nice jack-knife pick set a while ago, and have been very please with it so far. The picks are very high quality. They do bend, however, unlike cheaper picks, they don't break. If they happen to accidentally bend slightly, you can just slowly bend them back into place. When I order this set, I thought the handle of the "knife" and the fact that there occasionally is a bit of "blade-play" when picking, that it would be hard to "feel" the pins with, but I was wrong. Have not opend but I know it is good, used it before, it is not cheaply made, and got it for an amazing 26.99 that is cheap compered to 50.00. Anyway this is for my kit, i suggest you dont use this as a toy, and get it for emergany's only dont go around picking random people's locks it is a good way to get shot or 15 years class b felony breaking and entering, for EMERGANY ONLY. Haaaaaaaaaa you know whats funny I had evan figured out he was just being nice to me cuss i bought stuff WRONG I kept emailing him being a jerk to see if you would treat me any diffrent, it was amaazing he still treated me with alot of respect, and cared about me, I feel like trueswords.com is to good to be true low prices amazing swords, everything ive bought here has worked, fast shipping evan sent me a free thing of oil as well, for a sword I orderd a while back. I love trueswords, as far as the knife picking it works ive used them before it works on doors, padlocks soem car locks ect thankyou evan from trueswords.com I DONT LIKE HOW TRUESWORDS TREATS ME SO WELL, AND I SAY IM NOT COMEING BACK, THEN I END UP SPENDING MY MONEY ON GREAT DEALS, BECAUSE THEY HAVE SUCH GREAT PRODUCTS AND CUSTOMER SERVICE. Great lock picking device! Careful of over exerting the pieces. Excellent product! Delivery was incredibly fast. This things works amazingly! I highly recommend this to all beginners and experts. This is the third lock pick set i have ordered and it is definitely the best. I was unsure if it came with a torsion wrench since its not included in the picture, but it comes with a nice one. The picks seem a little bit flimsy but they work well, and it fits nicely on my key chain. Overall i would recommend it to anyone because it comes with all the tools you need, and you don't need to worry about misplacing them. Beautiful finish and nice feel when holding it. Everything comes out smoothly if you work on opening and closing it quite a bit when you first get it. The variety of picks is amazing! I still haven't found each one's specialty, but it should be awesome. THE ONLY PROBLEM: once the set screw is tightened, it tends to loosen with just the slightest force on it. When picking, it can loosen itself sometimes. Luckily, you can usually find a way to hold it with your fingertips when picking and constantly apply tightening pressure on the screw so it never comes loose until you're ready. Other than that one little thing, it's an EXCELLENT product! So I received this item within 4 days of ordering, which is very impressive. The Jackknife is smaller than I expected, but this is better, as it is more portable. Plus is comes with a key ring, so it can be with you always. First off, the tension tool takes some doing to get out the first time. But once that initial release, it's much easier to get it in and out. 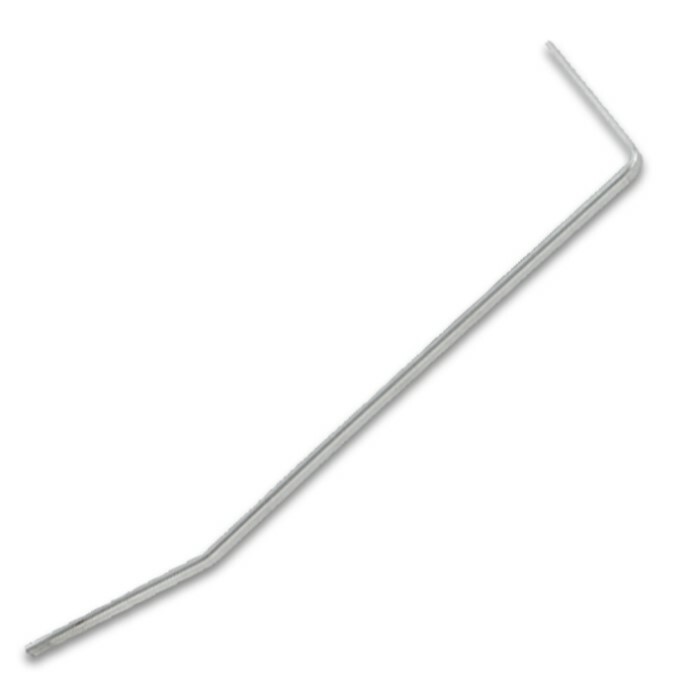 The screw bolt is very sturdy, and really locks the picks in place when picking. The Jackknife style also makes raking much easier. Also, this is a SIX pick design, whereas the original was only a FIVE. The sixth pick, which is the second one from the right (as pictured), is an amazing addition to the others. Due to it's "teeth", I was able to pick through a padlock, combination lock, and basic "Brink's Home Security" strongbox. And this is with a days worth of knowledge. No tension tool needed. I highly recommend this pick set for beginners, as if I can get through locks within SECONDS my first time with it, then anybody can. I do really recommend you get "The Complete Guide to Lock Picking" with it, because it does fill in the necessary blanks. **If you compare the prices of this item at Trueswords and the price from the maker, Southord, you save a full $13. Trueswords IS the best buy for this item on the online market.